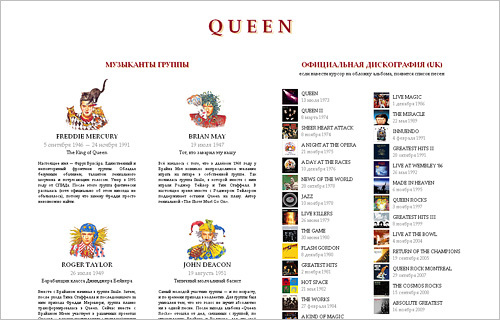 A website dedicated to Queen, the greatest rock band ever. 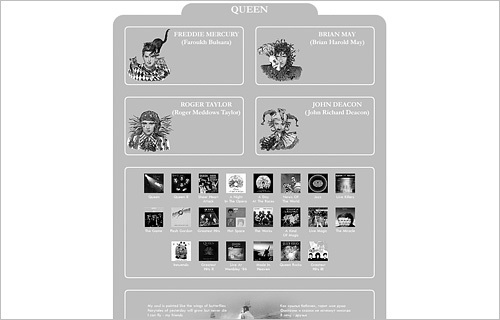 Website has brief information about band’s members, and official discography with songs listing. Website’s design is based on images from “Innuendo” album which, in their turn, are based on works of Jean Ignace Isidore Gérard who is best known as Grandville. In spite of publication date, this website works since 1 January 1998, and for the moment this is the final version of it. Earlier versions unfortunately gone away.